Today we welcome yet another special guest, Roseanna White, author of A Stray Drop of Blood . If you aren’t familiar with this name, get familiar with it. She’s an amazing writer and destined for great things. Take it away, Roseanna. As a teenager, I had a whole host of ideas in my mind for stories. Some of them I diligently worked on, some of them I shoved onto a mental shelf . . . and some of them I knew were a little beyond me, so I filed them away and jotted notes as handy facts happened by. One of the biggest ideas I ever had started as a short story I wrote on Good Friday when I was fifteen. I entitled the story "A Stray Drop of Blood"—it was about a woman in the crowd at Jesus' trial and crucifixion, one who had gone to seek revenge on Barabbas but instead collided with forgiveness. I knew then that the story would become a book, but I also knew I was in no place to write it. Then I went to St. John's College, a little Liberal Arts school that focuses on the Great Books of Western civilization. As I went through the Program, A Stray Drop of Blood came to life in my mind as I gained the knowledge and tools I needed to write it. During my sophomore year, we read through the major books of the Bible in about four months for one of my classes. We started, naturally, with the Old Testament. Never have I read so much of it so fast. We flew through the historical books of Genesis and Exodus, we swallowed whole the Law, and we paid close attention to the Prophets. There was a pit stop at the Psalms (which was like vacation after the Law!) and we admired how the Psalmists always looked to God with hope after every lamentation. I was so blessed to have an Orthodox Jew as one of my teachers in that class. Those of us raised in the Christian church often just get versions of the story that have been distilled over the centuries into what the great minds deemed the “important” facts—basically, we get interpretations. This is fine, in that the full scope of the thing is a bit much for us to understand as we come to faith. But I was at the point where I wanted to go deeper. But again. . . why? Yes, I believe in fact that they are foretelling the Christ. But I needed to be challenged. I needed to think about it a different way. I needed to see why some people can believe all the same historical facts that I do and not come to the same conclusion. I especially remember reading the end of Isaiah, where it is prophesied that there would be no more prophets. This at first confused a few people in my class, since for the same day we had read other prophets who were after Isaiah in the Bible. Thankfully my Bible has that handy-dandy info at the front of each book, which told us that Isaiah is chronologically the last book of the Old Testament. But still—why? What changed that this was necessary, why did God stop speaking like that to His people? After that, we jumped to Roman texts for a while. Talk about a culture shock! From a world of strict laws and consequences when you break them, all based on their unique belief in the one God, we learned of a society founded instead on politics and ambition. Religion did not control the day in Rome. They were far more concerned with themselves than spiritual matters. Hedonism, Stoicism . . . words embodied by these builders of empires. Having read a ton of Greek philosophy the year before, it was easy to see where they got their foundation, but the Romans took it to another level. They didn't want to be beholden to the Greeks for anything, so they created stories to one-up the Greek mythology (like the Aeneid. 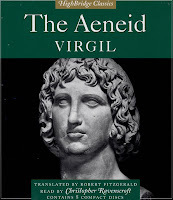 Did you know that Caesar ordered Virgil to write it so that they had something to compete with Homer's Iliad and Odyssey?). At first when I saw the reading list and realized we'd be jumping from the Old Testament to Roman stuff then back to the Bible for the New Testament, I thought it was just a matter of chronology. But then I started reading those familiar Gospels . . .
And that's when it hit me (thanks to the perspective of some students who hadn't been raised in the church): there was a pretty vast break in thought between the Old and New Testaments. The people who spoke in the Gospels talked about issues, assumptions, and beliefs that just weren't present in the Law and the Prophets. Suddenly they were concerned with heaven. Eternal life. Focused on the heart and mind. All things that make perfect sense to us, but conspicuously absent from the Old Testament (not to say there wasn't a foundation for it, but it wasn't the prevalent way of thinking). So what happened in the couple hundred years between Isaiah and Matthew? That's when it hit me even harder: the answer to that “missing” era lay in the stuff we read that seemingly had nothing to do with the Bible. Putting it all together, a really awesome picture appears through the mist. All those Ancient Greek philosophers, the writers from Ancient Rome, even some of the religious movements like the Zealots, began to sneak into the mind of the everyday man. And they combined to bring a new awareness of the world we can't see. Of the importance of intent. Of the life that awaits us after we die. All of that worked perfectly into the idea I had for Stray Drop and helped me come up with a cast of characters covering the full spectrum of beliefs that would have been popular in Jesus' day. There are those in the legalistic mindset, who stuck to the Old Testament views and made them even stricter. There are those who are in the “question everything” mindset of the Ancient Greeks. And there are the “who cares? Let's just party!” people that Rome became famous for. Researching for this book, reading all those texts in my college classes, made me see the glory, the beauty of this history that the Lord has written. It isn't just that He gave a Law that was so complete. It isn't just that He gave His Son. It's that He chose that perfect moment in time to do so, after preparing the hearts and minds of the world for centuries. Had Jesus come two hundred years earlier, His message may have been even more confusing for the people. Had He come two hundred years later, Rome's grip on Israel would have been so drastically changed that the people wouldn't have been crying for Messiah like they were then. Sometimes, it's just really stinking cool to see the hand of God in history outside the Bible. It fills in some of the colors you may not have realized were faded or missing and makes the tapestry that much richer. Nothing in my life has made me love Him on which my faith is founded like taking a step back and looking at the picture from a new perspective. Not just the Old, not just the New. The Whole—and that requires taking a glance at the middle. Roseanna M. White is a wife, mommy, writer, reviewer, and lover of all things literature-related. She makes her home in the mountains of Maryland, where she runs the Christian Review of Books. She is a member of ACFW, HisWriters, and HEWN Marketing. Israel's unrest finds a home in her bosom, but their rebellion tears apart her world. Death descends with Barabbas's sword, and Abigail is determined to be there when the criminal is punished. But when she ventures to the trial, Barabbas is not the one the crowd calls to crucify. Instead, it is the teacher her master and Jason had begun to follow, the man from Nazareth that some call the Son of God . 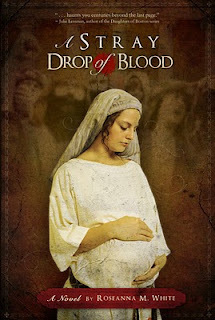 . .
Click Here for Dina Sleiman's review of A Stray Drop of Blood. Short version, looooove it!!! Buy a signed copy of A Stray Drop of Blood from Roseanna’s mother’s store: then email Roseanna at roseanna@roseannawhite.com with how to personalize it. Use coupon code BLOGGER for 20% off. Roseanna will be stopping by today. Please feel free to leave questions and comments for her. I'm sure she'd love to get to know you all. Do you have a favorite Bible story or work of Biblical fiction? Thanks for having me, guys! I'm looking forward to chatting with you all today! Hi Roseanna, I guess those kids have you up early. Good to see you're chomping at the bit to come and visit. Your college sounds amazing. I did have to take Old and New Testament along with four consecutive sememsters of humanities, but we didn't do nearly that much reading. Sounds like God had you in the perfect place to discover the plans he had for your book. I was so impressed by your knowledge and understanding of both the Bible and the Roman culture as I read Stray Drop. Ladies, don't let that sweet young face fool you, Roseanna has a lot of wisdom to share. Over the last few weeks, I've been reading PAGAN CHRISTIANITY. One of the things I read that has lingered the most with me is knowing the context of the scripture, knowing who the author/speaker was talking to, knowing the mindset of the original reader of the letter, etc. Fascinating post, Roseanna! I loved both the history of it all and the story of how God works in each of us to create and do the things He puts in our hearts! I have a huge amount of awe for anyone who undertakes a historical such as this. My little bit of bible history has helped me understand the times of the N.T. As Gina mentioned--knowing who the 'audience' was at the times makes a big difference. I must say I am so intrigued by this book. Word of mouth is a strong selling tool! And A STRAY DROP OF BLOOD is wow-ing the audience. Congratulations! Deb, my daughter and I both became downright anti-social while reading A Stray Drop of Blood. And following up on Gina's comment, reading Roseanna's novel is a great starting point for understanding the mindset of the New Testament audience. I love it when I can be entertained and educated at the same time. This book is mentally and spiritually stimulating. And in some of those steamier scenes....hmm. Let's just say it's very romantic too. Roseanna, I've heard RAVES about your book and have added it to my pile! Thank you for exploring one of the myriad of little-explored stories of our faith! You may just have a new influencer--without even asking. Whew, glad I'm not boring everyone to tears! O Wise Sage of Limitless Knowledge, I welcome all pilgrims on their journey to the land of "Making Roseanna's Day." Seriously, can you all tell I'm truly enthusiastic about this book? Probably because it's not technically CBA. Okay. Enough. I'll shut up for a while. My interest is sparked. I like how you used your school work for your life work, and your church life in your writing life. Thanks, Mary. I confess that in my life, everything tends to go back to writing, LOL. Just last night my husband told me something he'd read on the news and I said, "Hmm . . . think I can work that into a novel?" Insert him rolling his eyes here. Very fascinating! And, having read your book, I see how you wove that into the story. Jesus came at JUST the right time! There is always a deeper facet to God's plan. We just have to be willing to seek the knowledge. Good job! And that books sounds very cool! I love that there are so many layers to God's timing and plans. It reminds me once again how beyond He is. Beyond anything I even know to wonder about. Thanks for the reminder Roseanna. Can't wait to get my hands on a copy of Stray Drop. Roseanna, thank you so much for sharing with us today. I loved reading this. This is an area of history where I have limited knowledge and one I'd love to learn more about. I look forward to reading your book. It sounds fascinating. I was trying to think if I had any questions for Roseanna, since we email all the time and have talked at great length about this book. I did think of one, though. Abigail is very young in the book. Is there a specific reason you chose to make her so young? I know it added an extra level of emotion for both my daughter and I since she is about Abigail's age. Have you noticed any specific positive or negative reaction to her age? Well, Dina, the major reason is that women got married pretty much as soon as they hit puberty back then. I was stretching it by making her 14 at the start--13 would have been closer, but I just couldn't go to middle school age, LOL. So while it's striking to us, it would have been odd for a young woman of such beauty and good-training to be unmarried much longer. I was looking at this book simply based on the title, because anything about the blood tends to draw me in. After reading your post I've got all kinds of reasons to pick this up! Nice to "meet" you here as guest Inkie! Looking forward to your story! What a journey you've been on to get this book written and published. It sounds fascinating and a must read. I'm amazed at your education and how you thought about this story early on, and how God allowed it to percolate in your mind until it was ready to spill on the page. What are you working on now, Roseanna? Right this second, I'm writing a modern day pirate story, featuring a displaced Bedouin woman, an ex-SEAL who rescues her from a Russian pirate, and the black-market arms dealer the pirate stole her from, who's out to get her back at any cost. Also in the works is a sequel to Stray Drop, tentatively titled WHO QUICKENS THE DEAD. A 20s archaeology story set in Egpyt, called THE STARS AND THE SANDS, and a million other ideas are waiting, including sequels to the two contemporaries and the 20s Mafia story that are at under review at the major pubs . . .
You know, I think I'm scattered. LOL. Great post, Roseanna! This is an area of interest for me as well. Our God is so much bigger than the box in which the Western mind-set has placed him. I love reading about how God has worked and moved in the history of man. Good job! And the book is such a good read. Those of you who haven't read it yet, prepare to be carried away! Roseanna, congratulations on the success of your wonderful book! I loved it. Ooh, I was going to ask about Abigail's age but I'm too late! That's what I get for coming late to the party. She was very wise for a 15-yr old, but as you said, age doesn't necessarily equal maturity, does it? I was impressed with her ability to hold her own against those burly (and rather predatory) Roman men who wanted a piece of her. At the same time, she was a complex character: she failed sometimes in her struggles against sin. I appreciated your honest portrayal of a believer's spiritual journey. Your new book ideas sound fun. Hurry up and write! LOL. Thanks for visiting us today! And Susanne, she was indeed wise for her years--partially, I think, because women were raised to be adults by that age, unlike today when we're encouraged to be kids for a good while. =) But also because of all she'd been through--and her personality in general, LOL. I wasn't exactly typical for my age as a teen either--I was referred to more than once as the oldest young person the speaker knew. And I'm writing, I'm writing! Still have 800 words left in my goal for the day, so seriously. Back I go to writing . . .
Those are some stories you're writing, Roseanna! Modern day pirates, yikes! the sequel to Stray Drop sounds great as does the archeolgy in Egypt idea. You're one busy lady. Take care and come back soon. Thank you Roseanna for your wonderful history lesson! Loved it and can't wait to read your book. Roseanna, would you like to share a little about the vision of Whitefire publishing? Well, WhiteFire was my hubby's brainchild. He's always had a passion for publishing--even back in high school, he said that was his ultimate goal. So in college, he worked at the St. John's print shop, where he learned all about the physical aspects of the job. The printing, the binding, the laminating, the press (or rather, he learned that he would need to be seriously schooled to run a press, lol), the technology. Not long after we graduated, he bought up a ton of printing equipment, intending to do digital print work, kinda like Kinkos. But books were still his ultimate goal, so he said, "Let's make a publishing division." Naturally, he didn't want to experiment on anyone ELSE, so he told me, "Pick one of your books for us to publish." Now, I had about twelve manuscripts at the time, none of which I wanted to relegate to the oblivion of a small press. It took some major prayer to get me on board with this idea, but once God had shaken the pride out of me, I knew that A STRAY DROP OF BLOOD was the book He wanted us to launch WFP with. We released it as a hardback in 2005, and over the next couple years discovered how little we knew about publishing, lol. But we added a few more titles to our roster, continued to learn, and have streamlined our shop. When we realized with some shock that we were almost out of hardbacks of Stray Drop, we sat down (actually, we went on a walk) and talked vision. For the book, for the company. We decided it was time to pull out all the stops, do a complete overhaul, re-release as a paperback, and use it as a springboard for an expanded fiction line at WFP. Our hope now is to start accepting submissions in the next few months for outstanding works of fiction that might not fit with traditional, big publishers. We're not afraid of "risky" stories, of "unpopular" settings. We believe in story, in the skillful telling of it, and in showing the stark beauty of reality as God's children--which includes the dark as well as the light. So our vision's still undergoing definition, but one thing is clear: we want to bring readers stories that reach them at their core, that they remember long after they turn the last page. If we can do that, it will be happy days here in the White house. Yeah, that was a leading question. I knew the answer, but I'm so excited about what you guys are doing over there, that I wanted everyone to hear about it. Okay Roseanna, you're scaring me. You had how many completed manuscripts? At what age? (okay you don't have to answer that) but it's obvious you are a strong writer. I love the sound of all your current WIPS! Well, at least, we have a good idea there's a lot more of Roseanna's work to come! Notice I made no claims of them all being GOOD. ;-) Headhopping all over the place. Though otherwise (aside from one that's way telling) they're not terrible. I don't think we have to worry about Roseanna running out of ideas to either rewrite or develop new anytime soon. =) My WIP folder in my Documents file is scary big.